Our Yetis have been hard at work creating a bunch of new product updates that will help you save time and close more deals including an improved Gmail Reminder feature, Click-to-Call from Salesforce, Outlook and Salesforce Calendar Integration, and more. Also new: Pick up right where you left off with the new option to add a note to a reminder. Want to make your job easier and help your team sell smarter? With the new Yesware Sales Activity Dashboard for Salesforce, sales managers can gain increased pipeline visibility and more insight into what actions result in closed business. 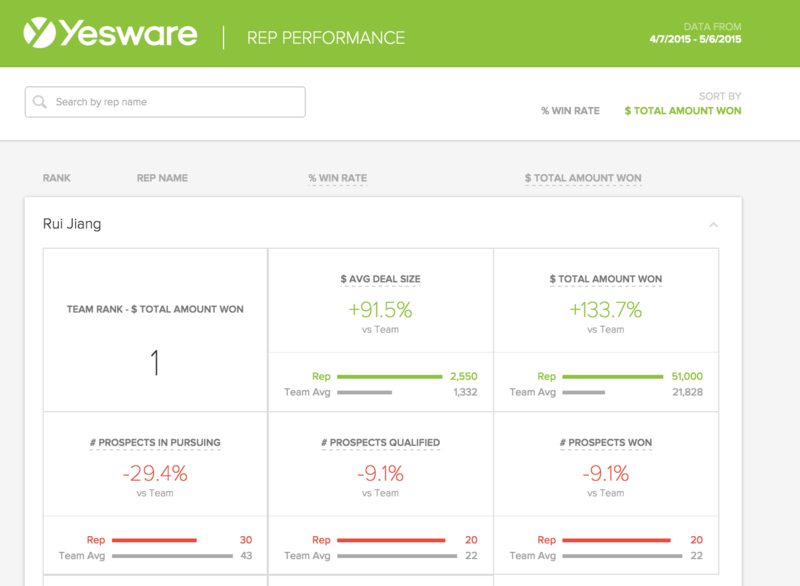 View overall team performance metrics, or search for individual reps to see how they stack up within the context of the team. Get it now for free in the Salesforce AppExchange. Dial your prospect as soon as you see that he has opened your email, clicked on a link, or viewed your presentation without leaving your Salesforce instance. Enterprise users can enable Click-to-Call from Salesforce to contact prospects in real time, and be able to view all of your prospect history, Yesware tracking data, notes and more in Salesforce throughout the call without clicking back and forth. 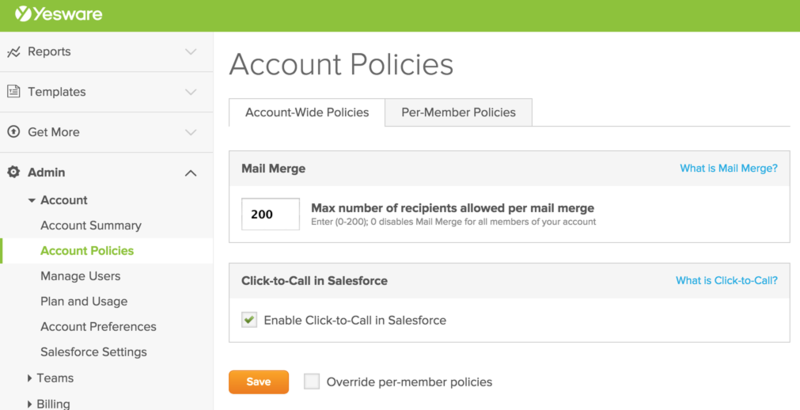 To enable Click-to-Call from Salesforce on your account, go to your Account Policies page, check the “Enable Click-to-Call in Salesforce” option, and press save. Tired of manually updating your Salesforce calendar every time you schedule a meeting? Now, Yesware syncs your newly-created Outlook events (and event updates) to Salesforce within a matter of minutes – no more calendar confusion. While creating a new calendar meeting in Outlook, click the “Sync to Salesforce” icon in your Outlook ribbon. Select the correct contact or lead in your Salesforce environment to associate the meeting with. Select the correct account or opportunity in your Salesforce environment to associate the meeting with. Create your Mail Merge messaging now, send later. Outlook users can now schedule a single-stage Mail Merge campaign to go out at the most optimal time without interrupting your flow to press send. To schedule your Mail Merge campaign, set up your Mail Merge like you normally would. At the bottom of the screen, you will see a window prompting you to schedule your Mail Merge to send at the time of your choice. Note: Your Outlook client must be open at the time specified in order for the Mail Merge to send. If Outlook isn’t open at that time, your Mail Merge will start sending automatically the next time you open your Outlook client.